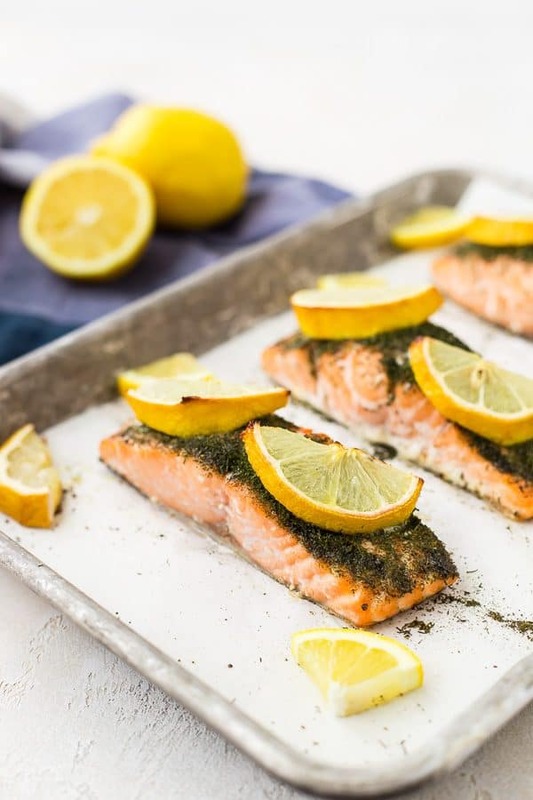 Lemon Salmon with Dill – easiest recipe! 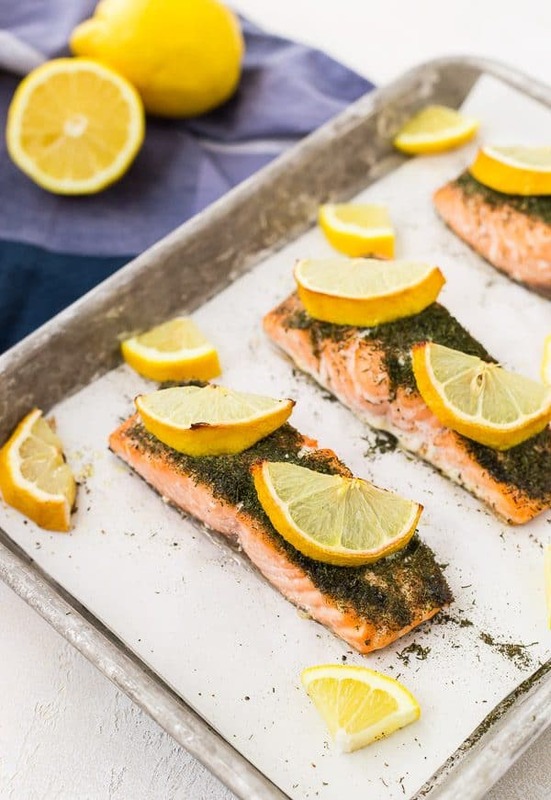 Lemon Salmon with Dill is going to be a weeknight lifesaver. It’s ready in less than 30 minutes, it’s healthy, flavorful and so ridiculously easy to make. You’re going to end up making it once a week! 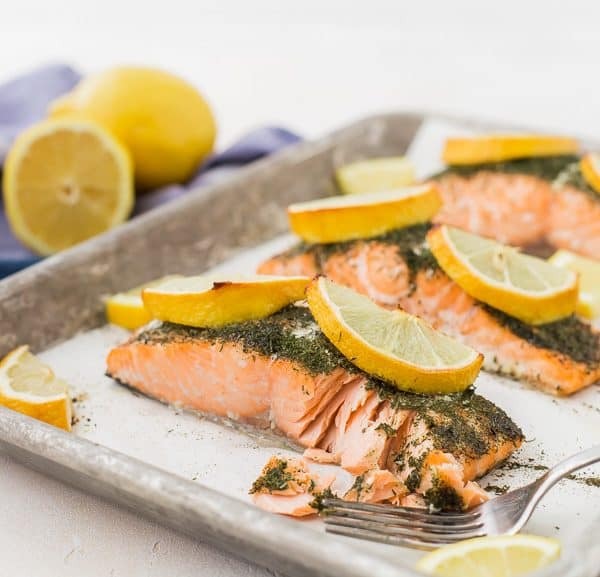 I’ve been meaning to post the recipe for this lemon salmon with dill (lots of dill!) for quite awhile because I make it nearly once a week, but it’s always too dark to photograph when I make it. Gotta love these Michigan winters! I finally made it on the weekend for lunch and snapped some quick pictures to share with you guys. It’s not complicated, but it’s one of my go-to recipes for a few reasons. Ben and I both love it which is honestly the most important thing. I love salmon a number of different ways, but this is hands-down Ben’s favorite way to eat salmon, so it’s the one I default to most of the time. It’s also Whole30 compliant which is a bonus! Ben loved the walnut crusted salmon too, but because of the kids’ allergies, we don’t ever eat that one (cue all the tears – it was a favorite of mine, too). 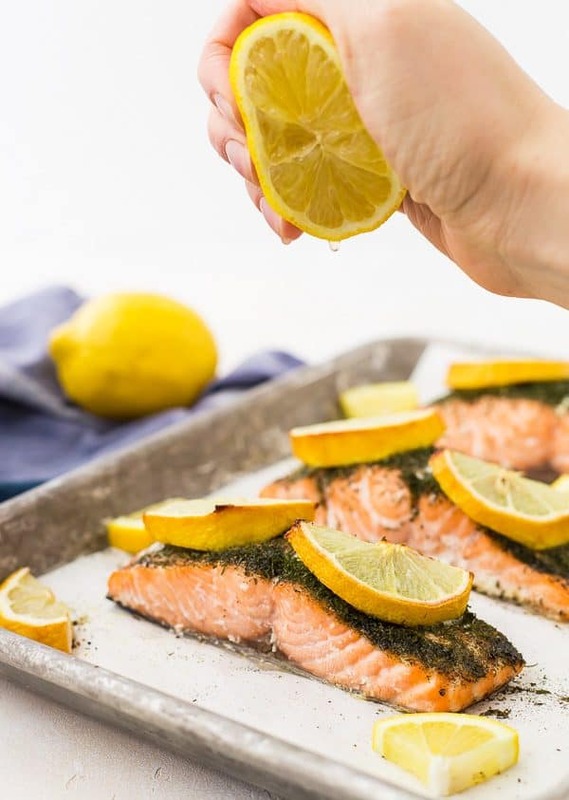 A recipe that’s not Whole30, but is one of my favorites is my baked salmon with maple mustard glaze – it’s completely irresistible! Another reason I love to make this recipe is because I always have dried dill and fresh lemons on hand. I know that if I buy salmon from the store, I’m good to go with the other ingredients. Can you use fresh dill? ABSOLUTELY. It would be delicious! 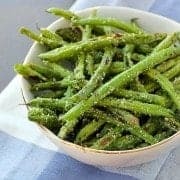 But it’s delicious and easier with dried dill so that’s the way I typically go, especially during the cold winter months. It’s also the perfect recipe for a last-minute Valentine’s Day dinner, if you don’t mind fish breath. 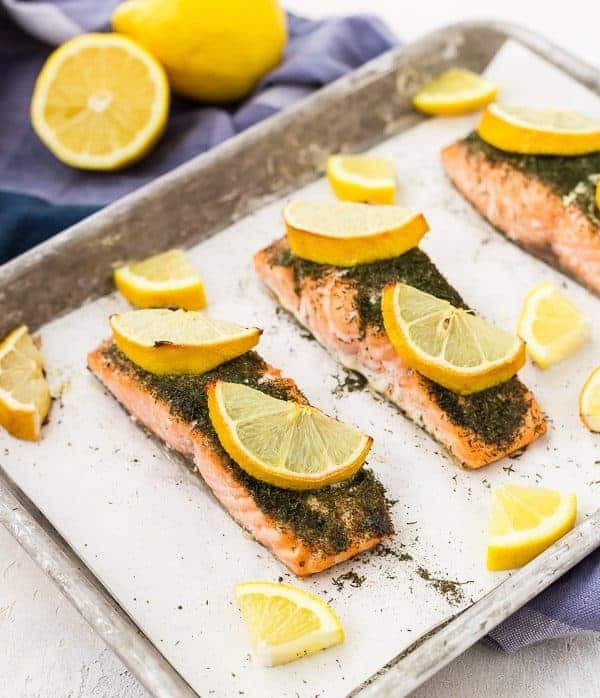 Baked salmon with lemon and dill is healthy so you have more room for decadent chocolate desserts and that glass (or two) of wine. Pair it with an easy Caesar salad with homemade Caesar croutons and a ridiculously easy chocolate tart — dinner is DONE! Ben has to work late tonight (happy Valentine’s Day to me…) so I’ll probably be eating popcorn in bed with Netflix on the iPad but maybe we’ll enjoy lemon salmon this weekend. As always, keep on scrolling for the full printable recipe! Rinse salmon with cold water and pat dry with paper towel. Place on sheet pan – I like to line with parchment for easy clean-up and to prevent it from sticking. If desired, cut salmon into fillets. Sprinkle with salt and pepper and then a good coating of dill. Place lemon slices on top of salmon and bake at 400°F – you’ll know it’s done when it’s flaky, or you can check the internal temperature with a thermometer (my Thermapen is my right-hand man in the kitchen). I like to cook salmon to an internal temperature of 145°F. Enjoy immediately (squeeze the lemon on it before digging in!) or flake on top of salads. You can scale it to feed as many people as you need. Ben and I can easily eat a pound of salmon between the two of us, but if you’re cooking for a crowd with side dishes and other components of a meal, you can plan on a pound of salmon feeding about 3 people. To give an idea of size, the salmon fillets in the photos are 1/3 pound cuts. It’s so easy! Comes together in less than 30 minutes! 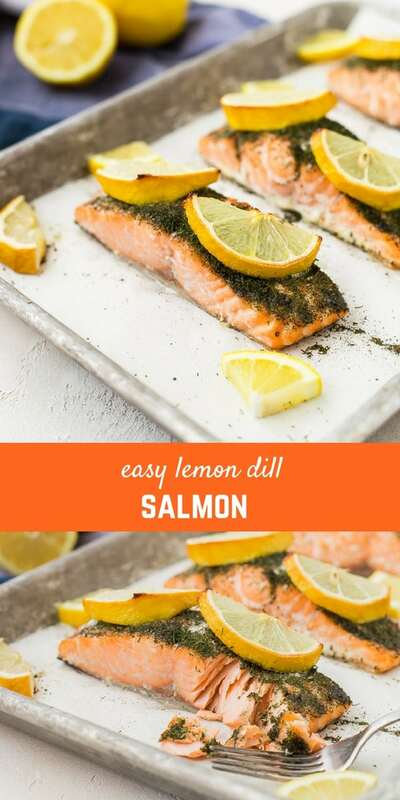 It uses only a few simple ingredients: Salmon, Lemon, Dill, salt and pepper. It’s great leftover – try it flaked on top of a salad! Preheat oven to 400°F. Line a sheet pan or baking dish with parchment for easy clean-up and to prevent fish from sticking. Rinse salmon with cold water and pat dry with paper towel. If desired, cut salmon into fillets (cooking time may increase slightly if you choose to leave it in one big piece). Sprinkle with salt and pepper and dried dill. 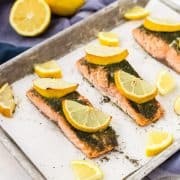 Place lemon slices on top of salmon and bake for 20 minutes or until flaky. You can also check the internal temperature with a thermometer (my Thermapen is my right-hand man in the kitchen). I like to cook salmon to an internal temperature of 145°F. You can scale this recipe to feed as many people as you need. Ben and I can easily eat a pound of salmon between the two of us, but if you’re cooking for a crowd with side dishes and other components of a meal, you can plan on a pound of salmon feeding about 3 people. Verdict: I love this salmon – it’s fresh, flavorful and tastes like a special treat, but it’s SO healthy. 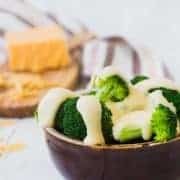 Husband’s take: This is one of Ben’s favorite recipes. Changes I would make: None are necessary but as always, feel free to make it your own. 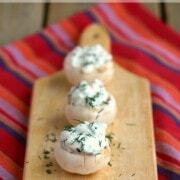 Add some garlic, use fresh dill, add some lemon pepper to drive home that flavor. Have fun with it! This was so easy and so tasty! I love dill! I love dill too! So glad you liked this!